An illustration of plaques, seen in brown, and tangles, seen in blue, in the brain. Alzheimer’s disease is the most common form of dementia, affecting 5.7 million Americans, according to the Alzheimer’s Association. There’s still a lot we don’t understand about the exact sequence of events that leads to Alzheimer’s, but we’re fairly sure that a brain protein known as amyloid beta plays a pivotal role. In its normal state, amyloid beta seems to play some unknown but important role in the brain (some scientists believe it might protect us from infections). But when amyloid beta molecules don’t fold the right way, they can clump together and damage the brain. By the time symptoms like memory loss and confusion show up, a person’s brain is littered with fiber-like plaques made of amyloid beta. 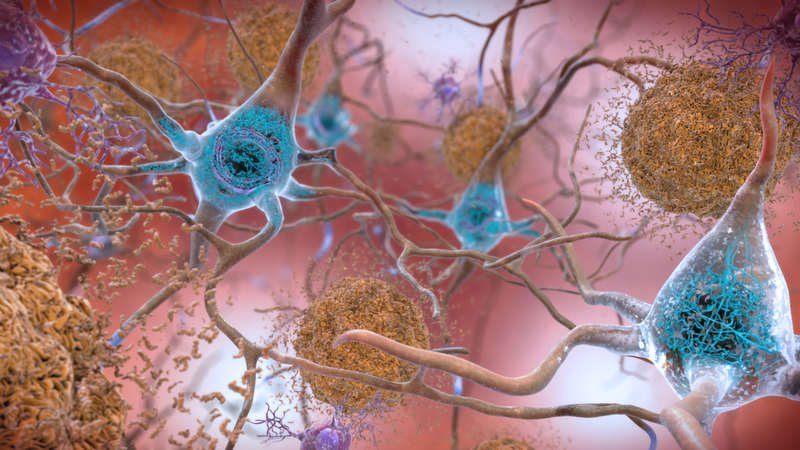 The accumulation of another protein called tau—known as tangles—might damage the brain and cause the symptoms of Alzheimer’s too, but the flooding of amyloid beta is thought to show up first and drive the progression of the disease. Scientists have tried to create drugs that delay or prevent Alzheimer’s by clearing away these plaques, but the clinical trials of these treatments have abysmally failed. One theory behind this failure has been that the drugs are being used too late. By the time the brain is loaded with plaques, the damage is already done. That’s led some scientists to begin testing out their anti-amyloid beta drugs in high-risk people who aren’t yet noticeably sick. In recent years, though, there’s been research showing that while the accumulation of amyloid beta can cause Alzheimer’s, it’s not actually doing damage through plaques. Before they form into plaques, misfolded amyloid beta molecules bunch into smaller clumps known as oligomers. And it’s these oligomers, not the plaques, that seem to be the most toxic to surrounding brain cells. Researchers usually screen for potential drugs based on how well they bind to the structure of whatever particles they’re targeting. But according to senior study author Michele Vendruscolo, a molecular chemist at the University of Cambridge in the UK, this approach can’t work well for amyloid beta oligomers, since oligomers are unstable, breaking down and reforming constantly. Instead, his team says they’ve developed a technique to screen for potentially useful compounds based on how well they slow down the formulation of oligomers. On Monday, Vendruscolo and his team published a paper in Proceedings of the National Academy of Sciences detailing their method, known as SKAR (an acronym for Structure-Kinetic Activity-Relationship). Alzheimer’s is one of many neurological disorders caused by misfolding proteins—others include Parkinson’s disease and Creutzfeldt–Jakob disease—and Vendruscolo’s team believes that their approach could be used to find anti-oligomer drugs that target those disorders as well. The hype surrounding oligomers as the true cause of Alzheimer’s and similar disorders is certainly real, according to James Hendrix, director of Global Science Initiatives at the Alzheimer’s Association. But it’s not completely confirmed yet, he said. Scientists are currently testing out antibodies that target these oligomers in human clinical trials, Hendrix said, but if these trials fail, then it’s unlikely the research by Vendruscolo and his team will receive much attention. And if these trials do show some promise, then the team will still have to provide evidence that their molecules can do a better job than the experimental antibodies. Vendruscolo and his team have co-founded a biotech company, called Wren Therapeutics and based out of the University of Cambridge, to help them develop these drugs. He told Gizmodo that they’ve already tested out some candidate drugs discovered via their method on worms, and they’re currently testing them on mice. The mouse results are expected to be published next year. He also said they’d like to begin testing the molecules in humans within the next two years. According to Hendrix, though, the length of time it takes for us to know whether an experimental Alzheimer’s drug can actually work in people, from start to finish, is more like 10 years. Of course, given how devastating Alzheimer’s can be—not only to those afflicted but also to the people who love them—any research that can help us develop a treatment someday should be welcomed. But the history of Alzheimer’s drug development is regrettably filled with promising starts that end in disappointment. So, if nothing else, all announcements of groundbreaking discoveries in this field must be treated skeptically at first.